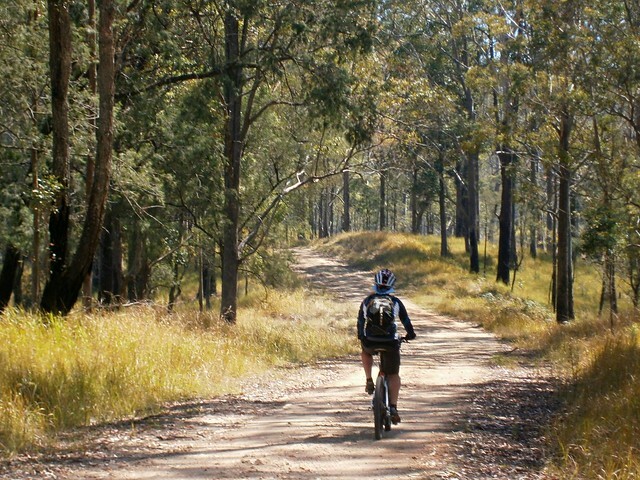 The Conondale Range is a beautiful part of the Sunshine Coast Hinterland located between Maleny, Kilcoy, Kenilworth and Jimna. 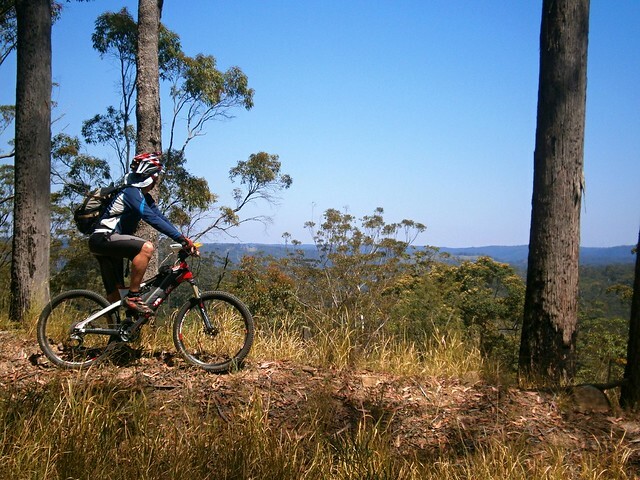 It forms part of the Great Dividing Range and includes rugged mountainous country, serene creeks, thick rainforest and some challenging but fun riding tracks. 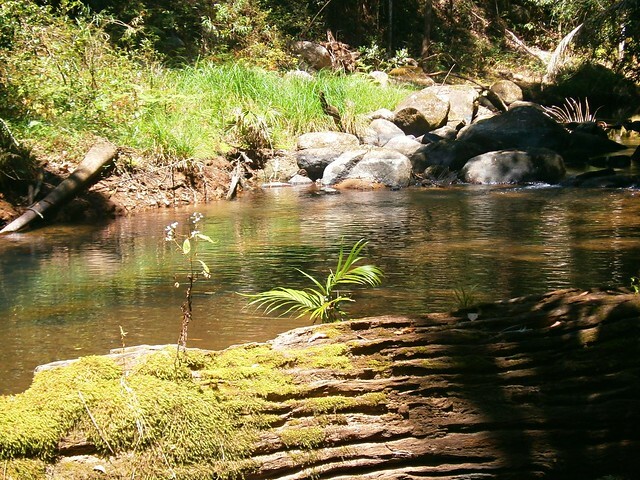 It forms the headwaters of the gorgeous Mary River, and is the northern most part of the catchment area for the Brisbane River. 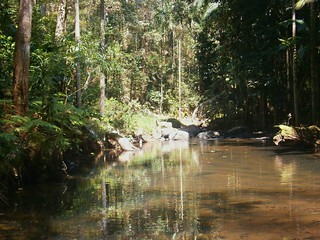 This area is part of the traditional country of the Gubbi Gubbi / Kabi aboriginal people. 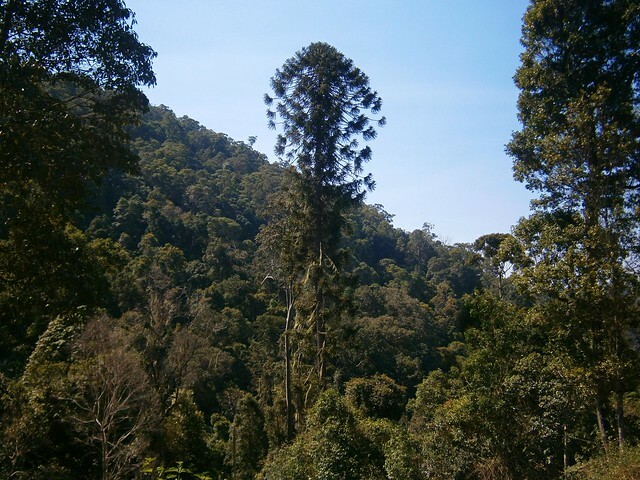 The Bunya Pine (Araucaria Bidwillii) which grows here is sacred to them as a food source and a focus of cultural activities including the triennial Bunya Feast mentioned by Tom Petrie in 1845. In 1842, New South Wales colonial Governor Gipps recognized this, made it illegal to clear any land north of Moreton Bay if it contained Bunyas. 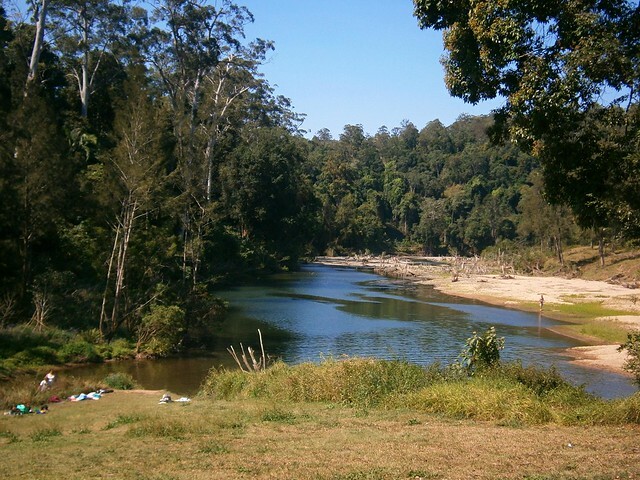 This postponed European settlement of the Sunshine Coast hinterland until the new Queensland Goverment repealed the edict in 1860. 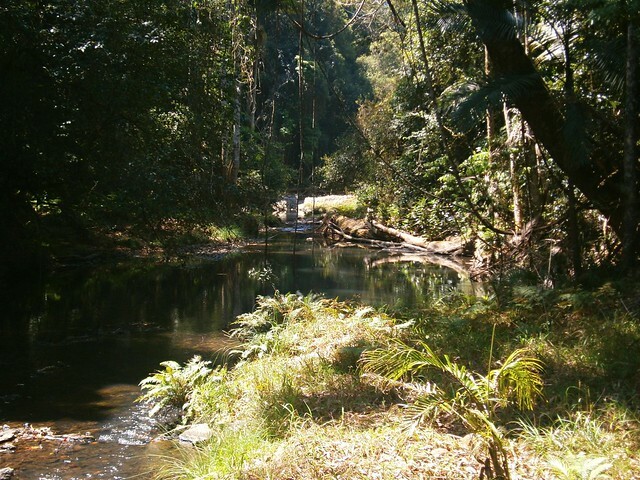 It wasn’t until 110 years later in the 1970’s that the Conondale National Park was established after a campaign by conservationist group, The Conondale Range Committee. 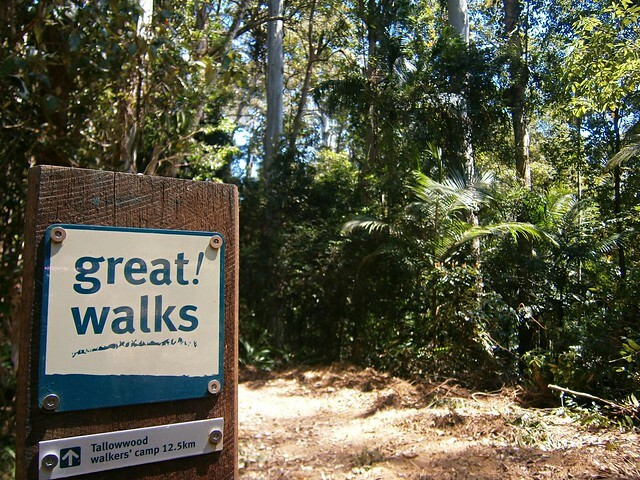 To their great credit, the local Gubbi Gubbi / Kabi people were instrumental in setting up the “Great Walk” trail – a popular route for many hikers today. 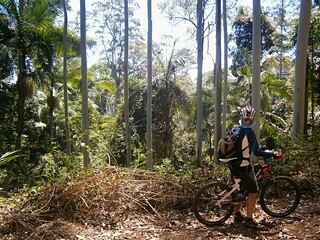 I’ve ridden in this area before with my friend Eric: In the southern section around Bellthorpe, and further north near Charlie Moreland Park and Booloumba Falls. After both rides, I started wondering if there was a way we could ride through most of the forest from south to north, starting at Bellthorpe, north of Woodford and ending at Charlie Moreland Park near Keniworth. Today we answered that question! 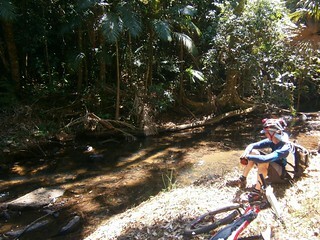 Rather than ride a big loop, we took two cars, parked one near Charlie Moreland Park (a couple of km from Kenilworth). We then drove the other car up to Bellthorpe in the south to start our ride. This meant we could cover a greater distance. 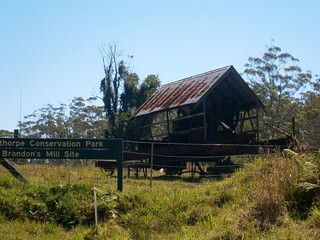 After a harrowing drive up Grigors Road from Conondale, we parked Eric’s 4wd at Bellthorpe near the site of the old Brandons timber mill site – a reminder of the logging history of the area. 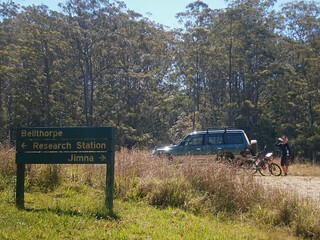 We headed north along the road to Jimna. It’s a popular 80km drive for 4wd enthusiasts. Our aim was to follow the road part of the way, then veer North-East into the forest along one of the fire management roads. Along the way, we enjoyed the stunning views to the west. After about 45 minutes we reached our intersection and stopped for a quick bit to eat. 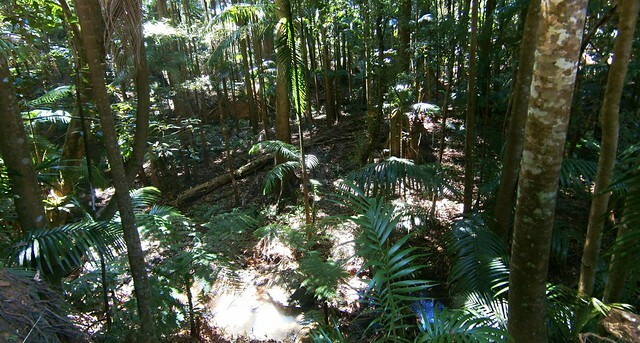 The climb out of the creek crossing took us through a variety of different landscapes including some ancient rainforest, as well as a small hoop pine plantation and some open Eucalyptus forest. The Fire Management Road overlaps with the “Great Walk” trail for several kilometres. The Great Walk allows hikers to complete the 56km circuit in about 4 days. 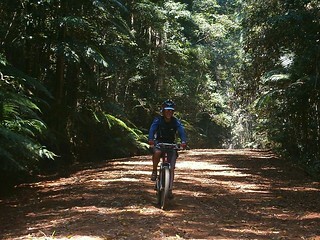 As we headed further north, we eventually crossed Booloumba Creek, then met up with Forest Drive – one of the forest roads we had ridden on one of our previous rides. Rather than follow this busy gravel road back to Charlie Moreland Park, we detoured via another fire management road in order to find another way down the mountain. The fire management road dropped us out on the main road at Cambroon, and we followed the paved road for a few km back to the end point of the ride on the banks of the beautiful Mary River. We rode 40km in just over 3 hours (4:15 including leisurely breaks). 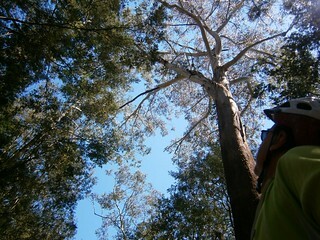 I burned 3,500kcal and we climbed over 1,100m in vertical ascent. 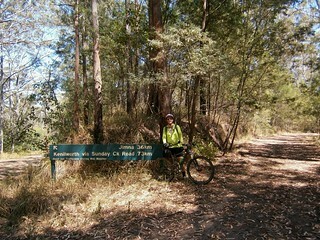 We also enjoyed over 1,500m of descent since we started at a higher point than where we finished. Because of the remote country, and logistical difficulty of setting this ride up, it rates 8 out of 10 on the tough-o-meter. Maybe 7.5 out of 10 if it was part of a well organized ride.